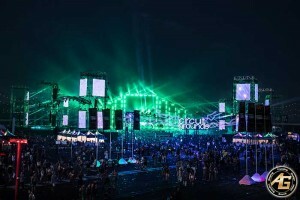 USA – The Electric Daisy Carnival, (EDC) returned to the Las Vegas Motor Speedway to celebrate its 20th year of providing high energy dance music in a community of love, respect, and togetherness. EDC took over the infield of the speedway 17th - 19th June, 2016, with over 400,000 attendees taking in 300 DJs from sunset to sunrise each day. 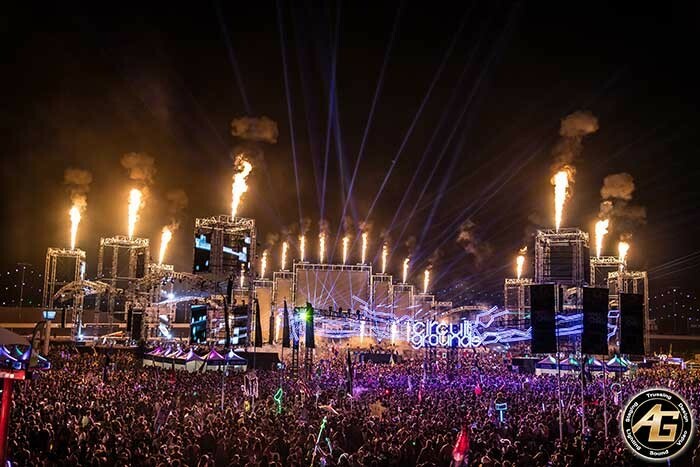 For the seventh year, AG Production Services helped light up the Electric Sky for EDC. Steve Lieberman of SJ Lighting was the production and lighting designer tasked with bringing the Circuit Grounds Stage to life. “For this year's design, I had two goals: First, the grounds needed to accommodate twice as many people as last year. Second, I wanted to create a 360-degree environment that surrounded the crowd and made them a part of the experience,” says Lieberman. 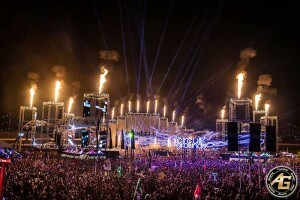 A pillar of the EDC community is togetherness and a sense of unity. Lieberman accentuated that philosophy by creating an environment where everyone comes together as one. “The design was meant to feel like you are walking into something monolithic, almost like walking into the Colosseum. The grand scale made individuals feel small, but as a collective, they experienced the music as one,” adds Lieberman. 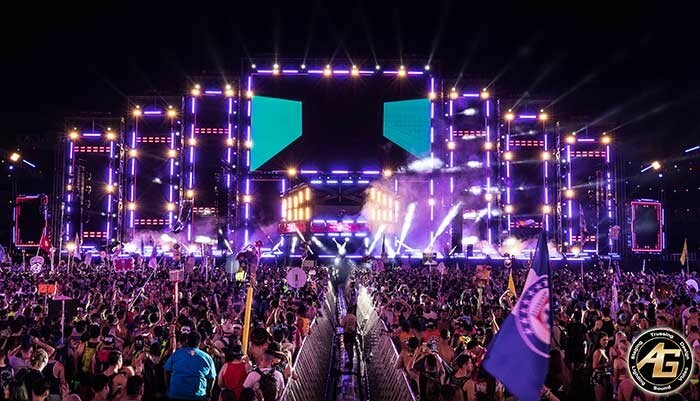 AG Production Services provided the entire structure, staging, lighting, and video for the massive 240,000 square foot arena-style stage and surrounding structures. 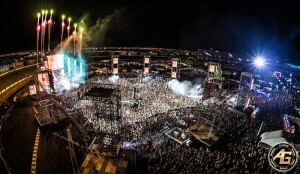 The main stage alone measured 240’ wide with the centre stage structure peaking at 88’ above the ground. Eight curved truss bridges spanning 98’ loomed over the audience and encircled the stage grounds. They connected to eight, 75’ high towers on either side of the audience grounds. The upstage wall was made up of ten video panels of various sized screens, all using over 7,400 square feet of AG 8mm video panels. 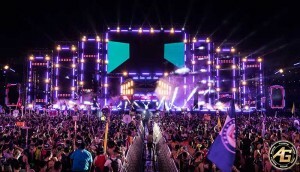 Facing the front of the DJ booth were 201 square feet of AG 5mm video panels. Each of the eight towers in the house used a total of 6,800 square feet of AG 37mm video panels, with two screens per tower. The backbone of the video network relied on three Analog Way Ascender 48 units to distribute and manage the two, 4K pixel maps and video content inputs from the various guest VJs and house VJ, Vello Virkhaus. Upstage and directly behind the DJ, Lieberman included an 8x3 panel wall of Edison 25 light fixtures from Doug Fleenor Design. The Edison wall consisted of 600 x 25W tungsten lamps that produced low resolution content to highlight and define the DJ. Each of the video walls throughout the entire space was lined with Elation Color Chorus 72 LED stripes, Elation CUEPIX 2 lite blinders, and Martin Atomic 3000 Strobes. All of the towers within the house included an alternating pattern of Robe Robin BMFL Spots and Robe Robin Pointes. This setup was replicated on the bridges connecting each of the towers, plus the Vari-lite VL3500 Wash.
On stage, the vertical trusses between the video panels included Robe Robin Pointes and Robe Robin BMFL WashBeams. Each of the four onstage audio towers were hung with eight Vari-Lite VL 3500 Washes. Controlling the 99 universes of lighting were two MA Lighting grandMA2 Full Size and 13 MA Lighting NPUs. The backbone of the entire network ran over fibre-optic to ensure fast connection speeds and quick response times for programming changes.